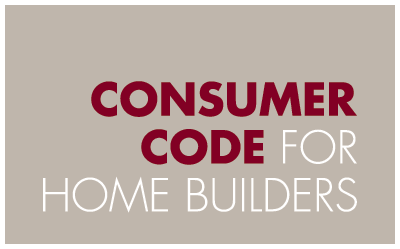 The Consumer Code applies to Home Buyers who, on or after 1st April 2010, reserve to buy a new Home built by a Home Builder under the insurance protection scheme provided by NHBC (National House Builders Council). The Consumer Code sets requirements that Home Builders who are registered with the supporting Home Warranty providers such as NHBC must meet. The NHBC have agreed to require all their registered builders to adopt and comply with the Code as a condition of their registration. Where a Home Builder is found to be in serious breach of the Code, the NHBC can apply a range of sanctions, including removal from the relevant Home Warranty Bodyâ€™s register and exclusion from all registers run by other Home Warranty Bodies who participate in the Code scheme. A Home Buyers rights under the NHBC is explained in their booklet â€˜Why Buy This Homeâ€™ which can be downloaded below along with a copy of the Consumer Code.